From 19th to 21st of August one of the world’s largest numismatic firms, Stack’s, Bowers and Ponterio, is conducting their 179th and 180th auction in Hong Kong. This is one of the auctions leading up to the Hong Kong International Coin Convention taking place from 23rd to 25th of August where more than 120 exhibitors from 20 counties will attend. This sale is a great chance for collectors and other interested parties to buy some very attractive rarities of Thai coins, medals and banknotes. 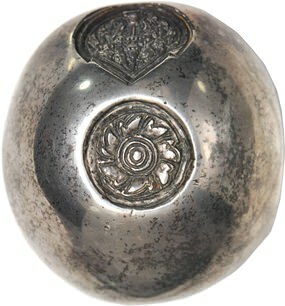 This Thai Silver Coin does have the highest estimation in this sale, US$ 120,000 to 150,000. The coin is an attractive “bullet” coin minted in 1864 to commemorate the 60th birthday for King Mongkut, Rama IV. The coin has a face value of 80 baht but is also called a Chang or 20 Tamlung. 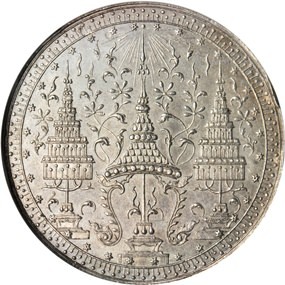 This is the largest Thai coin; the weight for this specimen is 1186 grams. It is also described as the rarest of all Thai coins. Only 8 pc are known, and three of them are in museums. 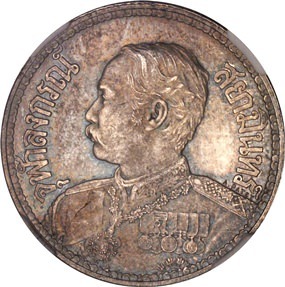 Another large bullet coin is also offered for sale, a 20 baht or 5 Tamlung minted during the reign of King Chulalongkorn, Rama V. The weight is around 300 grams so it does not take too much space in the wallet. 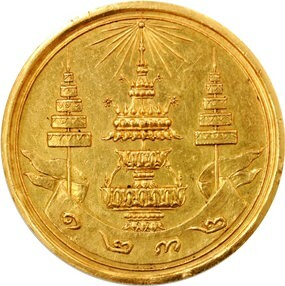 This is a commemorative coin minted in CS 1242 (1880) for the ceremonial cremation of the King’s mother Somdet P’ra Deb Sirindhra. This coin is also very rare and the estimation is US$ 40,000 to 50,000. 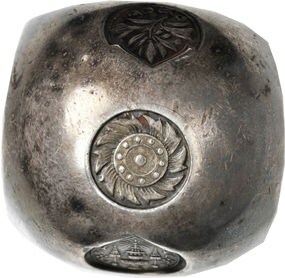 A Tamlung from 1864 described as The Finest NGC Certified. The grade is MS-61 meaning Mint State 61. This is a very good grade for this early, large silver coin from the reign of King Mongkut, Rama IV, commemorating the King’s 60th birthday. The coin is very interesting with the central Thai inscription on the reverse “Kingdom of Siam”. On the reverse the coin also has the inscription in Chinese “Cheng Ming Tung Pao” meaning “Negotiable Currency of Cheng Ming”. This coin weighs around 60 grams and is estimated from US$ 30,000 to 40,000, so for those looking for a silver investment this is not recommended. In 1907 during his second trip to Europe, King Chulalongkorn, Rama V, visited the Paris Mint. During the visit the chief engraver of the Paris mint from 1896, Henri-Auguste Jules Patey, also a sculptor, portrayed the King with a sculpture. The King was very happy with the result and ordered coins to be produced using the sculpture for their design. Unfortunately the King passed away before the coins were put in circulation, and the coins were distributed as a memento at King Chulalongkorn’s cremation. In the Hong Kong sale the complete set, 1 Baht, 1/2 Baht and ¼ Baht is offered as a Pattern Essai Set dated RS 127-8 (1908-09). These coins are all marked ESSAI, and in very good condition with nice toning. 19th of February 1993 Spink-Taisei had a similar set in their Singapore auction. In their catalogue they write that the ½ Baht is extremely rare, the others very rare. The estimation in 1993 was US$ 180,000 to 220,000 and the buyer at that time paid US$ 190,000 plus commission. The estimation for the set in the Hong Kong sale is US$ 75,000 to 100,000, which seems very conservative. An unrecorded gold medal, considered the first Non-Monetary Thai medal, is offered with an estimation of US$ 70,000 to 90,000. This very same medal has been auctioned once before, at Swiss Bank Corporation sale 42 on 25th of February 1997, the price was at that time CHF 52,000 plus commission. The medal was made to commemorate the 17th birthday of King Chulalongkorn and was also awarded to the winners of a competition designing decorations for lamps in the Grand Palace and other royal residences. The competition was also for the first time open for foreigners which can explain why the only known gold medal appeared in Switzerland. On 21st of August Stack’s, Bowers and Ponterio will be selling banknotes. In the Thai section there are 16 notes, all of very high rarity. A 1000 Baht note dated 11th February 1933 with the portrait of King Prajadhipok, Rama VII, is estimated at US$ 40000 to 60000. The note was approved by the Ministry of Finance on 30th of May 1934, but it was never put in circulation as King Prajadhipok abdicated on 2nd of March 1935. The note is of the highest rarities, only a few are known to exist. Another interesting note is the 1000 baht from 1948. The notes were produced by Thomas de la Rue and sent to Thailand. For different reasons the note was never put in circulation, one reason given is that the authorities were worried that a high denomination note would create inflation. During the reign, from 1946, of the present King Bhumibol Adulyadej, Rama IX, the highest denomination in circulation until July 1975 was the 100 Baht when the 500 Baht was introduced. 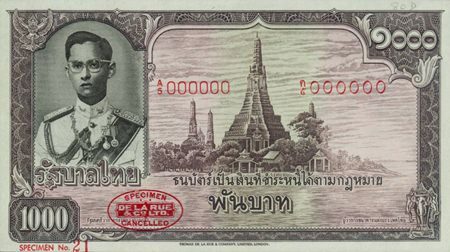 The 1000 baht was introduced in June 1992. 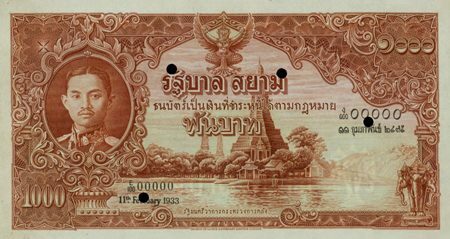 Only a few of the 1000 Baht from 1949 are known to exist, most of the notes were destroyed, and therefore the estimation is US$ 15,000 to 25,000.